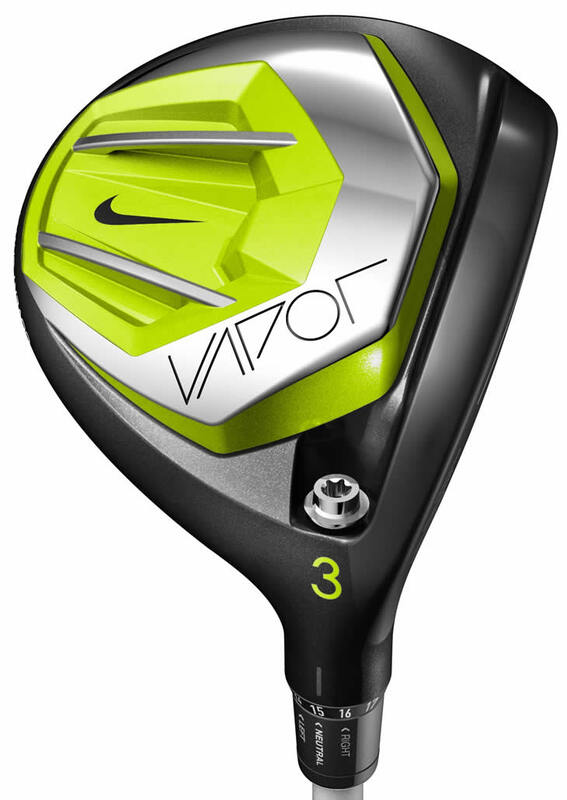 The new Nike Vapor fairway woods, comprising Speed and Flex models, feature Nike’s new FlyBeam-reinforced Covert Cavity Back design, a re-engineered Compression Channel and a NexCOR face – all combining to stabilise the chassis, maximise ball speed and promote longer and straighter distance. The low CG provides a high launch with a lower-spin flight. The Vapor Flex fairway wood highlights the same technologies found in the Vapor Speed on a more compact chassis, except the Vapor Flex has added Nike’s FlexLoft 2 adjustability system, allowing the golf athlete the functionality of five lofts and three face angles within 15 different settings. Back to black and yellow for Nike like they did with the SQ Sumo line some seven years ago. Three testers loved the new paint job, while one tester preferred the red of the last two years. All gave a thumbs up to the head shape, though. The crown isn't too distracting, despite the bright yellow tick on black crown in the bottom corner. Nice to see the crown and face as two very different, distinct colours - we find something as simple as this really does help set up to the ball with confidence. All four testers also liked the bright yellow scorelines on the face. One of the best lookers. One of the best 'feelers' in the test. Good feel off the face and easy to swing. It has a particularly pure sound - there's a real 'thwack' to it - and it also feels very hot when cracking one out the middle. Good feedback on off-centre hits. Impressive carry numbers, spin rates and accuracy for all testers. Really easy to get up in the air off the deck and it travels a mile off the tee with two testers receiving their longest average carry distances of 233 and 237 respectively. Very consistent yardage for each tester, which is important. Off-centre hits went pleasingly straight. Burns the wallet, but also the fairways. Superb distance to be had with two testers receiving their longest hits with this one. Consistency is what testers enjoyed most about this club. Average carry was similar on all shots for each tester. Off-centre hits also travelled better than expected. Not quite as easy to work as some of the others but that matters little when you can just rip one dead straight. One of the most forgiving models in the test and the standout in terms of feel. Fresh new sole looks didn't appeal to everyone but that's a personal preference. Very hard to fault and well worth splashing the cash on.